Another simple meal to put together after getting home from work at 5:30. 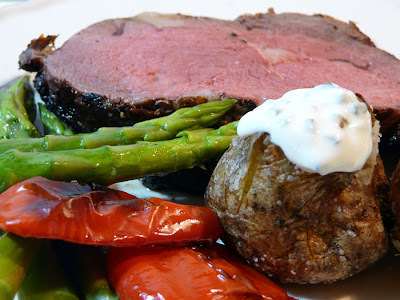 Grilled Prime Rib Steak for two, mini baked potatoes topped with sour cream and chives, grilled red peppers and fresh asparagus. That looks amazing (as all your meals do!) Great color and great photo. I'm salivating! 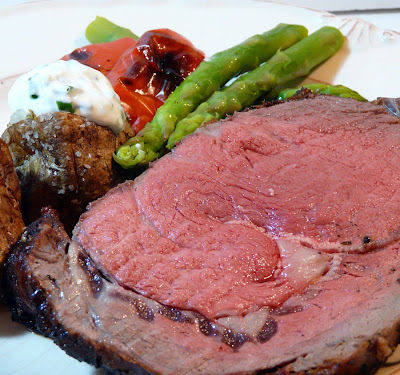 Just spotted this and the Prime Rib looks amazing and then I spotted the more important thing, you're in the Cowichan Valley, my old stomping grounds. I actually grew up in Duncan and you made me homesick, especially the pic of Cowichan Bay. Sigh. The Cowichan Valley has some awesome farms and grow an incredible variety of foodstuffs.